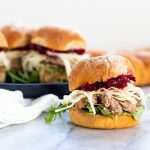 Slow cooker cranberry pulled pork sliders are topped with a tasty apple fennel slaw for a delicious fall sandwich! To make the slaw, slice the apple, cabbage, and fennel in the thinnest slices you can manage (especially the fennel). In a separate bowl, whisk together the olive oil, vinegar, lemon juice, and about 1/4 each salt & pepper. Combine with the sliced apple, cabbage, and fennel. Toss to combine. For the quick cranberry sauce, combine all of the ingredients in a small saucepan. Cook over medium-low heat, stirring and squishing the cranberries as they soften. Once thickened (10-15 minutes), taste and add more sugar if needed. When the pork is done use two forks to shred it in the crock pot (or you may remove it, but then put it back and mix with the juices!). To assemble the sliders, layer a small handful of arugula, pork, slaw, and cranberry sauce on a Dave’s Killer Bread Organic Sweet Potato Rock n’ Roll.